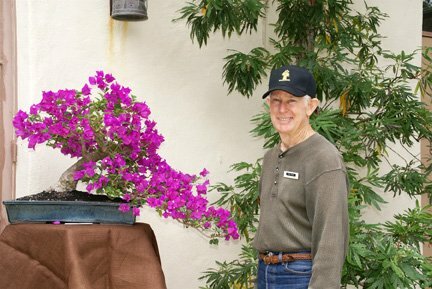 The New Year is here and it’s time to start transplanting, but if you are wondering just when is the optimum time, how drastically should those roots be trimmed, and what else do you need to know for successful transplanting and happy trees, then take heart: Mel Ikeda will be up here from his home in Costa Mesa to share some of his wisdom on transplanting. He will include in his presentation successful techniques for root pruning 2-year old black pines as part of their initial training. Mel’s presentations are always amusing and informative, so don’t miss it! We’re looking forward to the New Year. Your newsletter will list the many bonsai events and it is rewarding to attend as many of those as you can. January is the time for our club dues, $30, and for paying workshop fees. As we haven’t increased fees for many years, the board has decided to raise the fees for workshops from $25 per session to $27. It is a small increase for us, but will bring us more in line with other clubs and help our instructors deal with travel expenses. We will continue our 2 sessions of instructors. One will be on the 3rd Saturday of the month (9-12, 14) and the other will be on the 2nd Saturday of the month (9-12) with Ann Erb. Cami, our treasurer, is initiating a new system for paying dues, workshops etc. There will be pay envelopes available. If you would please include what your payment is for, it will greatly simplify Cami’s job. Our yearly show will be May 17 & 18 at the Botanic Garden. I am meeting with the garden personnel this week to get things rolling. It’s not too early to start thinking about a tree or two that you would like to show. We are planning a silent auction this year. If you would be interested in helping to coordinate that, please let me know. We will also need some special items for that event. Please start thinking about items to contribute. A big “Thank You!” to Cami Segna for hosting a great event. We had a good turnout, everyone had a good time, there was lots of good food, and the weather cooperated–up to a point (the patio heaters made up for the heat that Nature didn’t provide). The picture shows some of the attendees eating in the delightful wooded patio setting. That’s Cami in the red jacket on the left of the picture. I had a very interesting experience a few days ago in Mexico City that I thought was worth a paragraph in the newsletter. We were visiting the Flower and Plant Market in Xochimilco and discovered that there are several stalls there that sell very good bonsai and pre-bonsai. 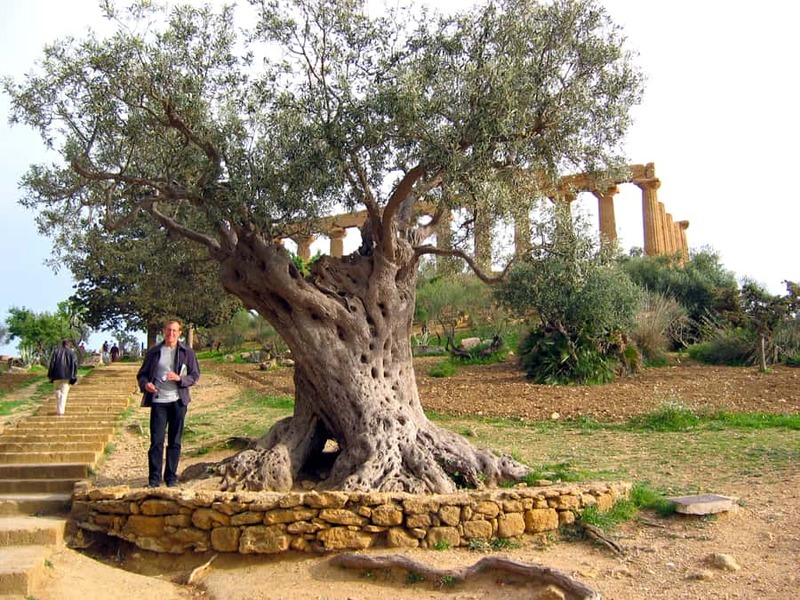 I especially liked the Mexican Bald Cypresses they were growing (see the rather bad picture I took), and I bought a Mexican-made bonsai pot that filled and weighed down my carry-on bag on the flight home. By sheer coincidence, the CMAB was having a year-end party there and they quickly invited us to join them. It was an enthusiastic and friendly group and we had a good time discussing bonsai while sipping tequila. Mauro Stemberger is a regular visitor there; he will be there again in just a few weeks. 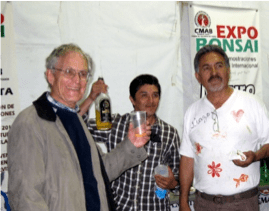 They also know Marco Invernizzi and have many visiting instructors from Europe, Japan, Puerto Rico, and from all over Latin America, but so far no one from the 50 states. 9 AM until noon, Room 8, Goleta Valley Community Center. Ann Erb, instructor. First of four workshops on the second Saturday of the month with the club’s own Ann Erb. Workshop fee is $108 per semester. Contact Ann Erb or Tom Post if you have a question. 9 AM until noon or 1 to 4 PM., Room 7, Goleta Valley Community Center. Roy Nagatoshi, guest instructor. New semester. Classes meet on the third Saturday of the month Workshop fee is $108 per semester. Contact Wally Kunimoto if you have a question. Los Angeles Arboretum, 301 N. Baldwin Ave., Arcadia. Ayers Hall. Hours 10 AM until 4:30 PM. 50th annual celebration. Demos both days at 1:00 PM. Bonsai material for sale. For information contact Lindsay Shiba at ljshiba@juno.com. Friday, Jan 31: Registration, Demonstrations, and Exhibit and Vendor areas set-up. Everyone is invited to share their treasured Shohin Bonsai in the Exhibit. Saturday, Feb 1: Exhibit Opens for Viewing, Vendor Sales, Critiques, Workshops, Bazaar & Benefit Drawing. Sunday, Feb 2: Exhibit open 10:30-Noon. Critique and Demonstration, Business Meeting. Registration Forms available on the website http://www.calshohin.org/. e-mail: calshohin@yahoo.com, or phone Randi Keppeler: 650-598-0127. Annual fundraiser for the GSBF Collection at The Huntington, 1151 Oxford Road, San Marino. Admission to the event is free with Bonsai-A-Thon “early bird” registration between 8 AM – 9:30 AM. Event hours are 8 AM – 4:30 PM both days. 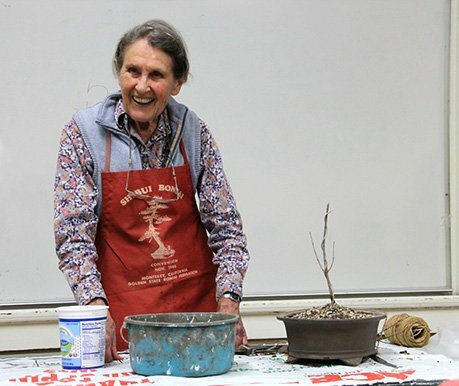 Sunday morning: bring-your-own-tree workshop led by Ted Matson – limit 10 people (for details contact Ted, tmatson@earthlink.net). Pancake breakfast, tour hosted by Jim Folsom (Director of the Garden), demonstrations, lunch, bonsai exhibits, large sales area, raffle, and auction. For more information, contact Marge Blasingame, (626) 579-0420 margeblasingame@att.net. Our annual show and plant sale at Santa Barbara Botanic Garden. It’s not too early to start thinking about what you’d like to show, so put the date on your calendar and start grooming your trees now. If you haven’t shown before, don’t be shy, you’d be surprised how nice your best trees will look when they are pinched, pruned, and groomed in a timely way and put in a nice pot on a nice stand. We also have some surprises for the show, as Tom hinted above in his President’s Message. More about them later. 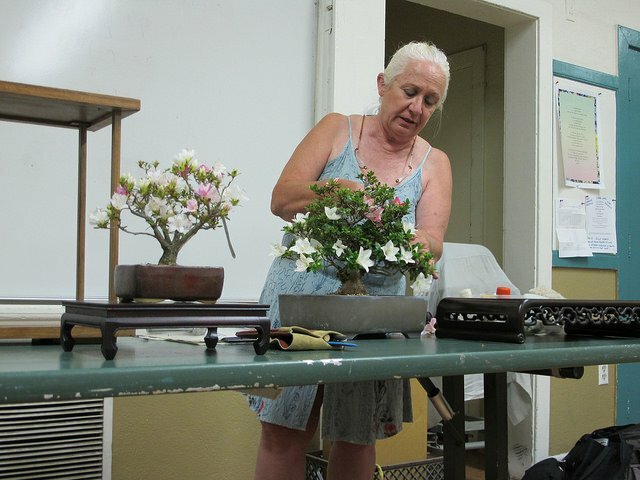 Bonsai Club of Santa Barbara is a member of Golden State Bonsai Federation and is a 501(c)3 organization. Bonsai Club of Santa Barbara Copyright © 2019.